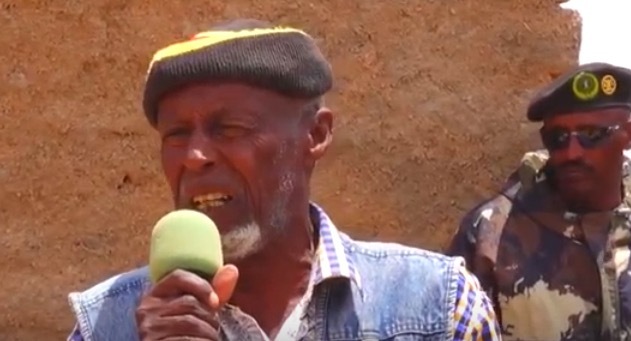 El-Afweyn, Ceeryaan(ANN)-Father Jama Mohamoud Ismail Hassan, 80, whose two grown up sons were killed in cold blood on Tuesday, opted for peace stating he had no desire for revenge or blood prize to build lasting peace at restive neighborhood. Jama spoke at a peace mediation venue in El Afwein, where Somaliland elders, traditional leaders, religious clerics and government officials were gathered to bring to an end a protracted conflict between two traditionally and maritally related clans in the area. Jama revealed that the two sons and a cousin of theirs, who had been killed before since a parallel conflict to that of El Afwein flared up between two other clans in the Ceeryaan area in 2013, left behind a total of 30 children whose responsibility now wholly rested on him. “I am not a fool although my halting words may make me appear so,” he began. “I accept every word of solace, every invocation for patience and perseverance the august gathering had given me. I sacrifice all feelings or drive to the contrary for peace – and that goes for all who belong to the same family/clan that I do,” he evoked, bringing tears to many of his listeners. “I have collected guns taken up for revenge from my sons and their close relatives and put them aside to lay the foundation for lasting peace,” he said. Mr. Jama said he hoped his sons’ killers would heed his words this time and sincerely exchange gunfire and revenge killings which never came to a rest for peace and co-existence as before. Jama’s sons were killed coming out from a mosque in which the morning prayer – Fajr – was just concluded. The attackers moved in on the village in the dark of night biding their time until it was the right time to strike. On their side, elders who spoke on behalf of the killers said they owned up to the act which nearly derailed the mediation process just begun in El Afwein, and that they will do anything in their power to come up with a fitting restitution. Given the spirit the bereaved father lent the atmosphere at the El Afwein venue, a lasting peace settlement to bring to a firm halt to a more costly, ethnic strife between two clans residing in the El Afwein area became so more possible.